...... I think I will be going to a full sole/ standard heel height when a resole comes up. 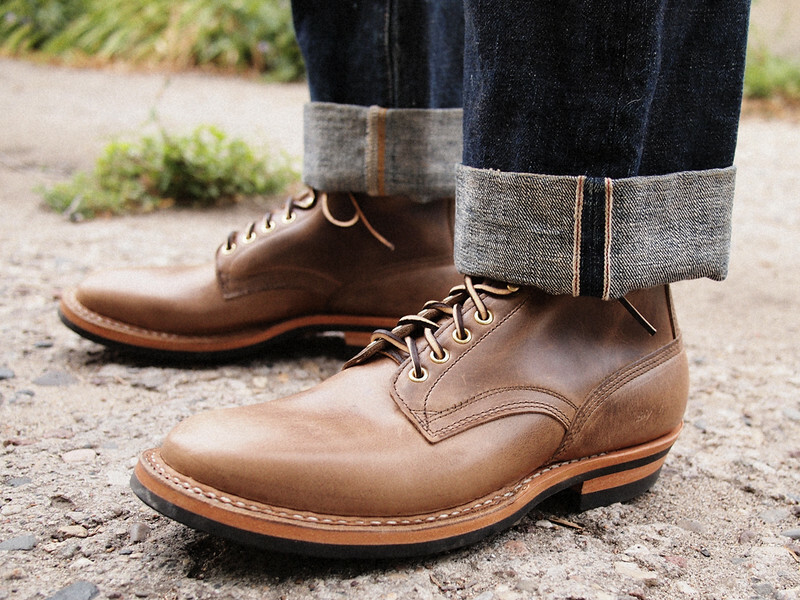 I also like the idea of a more Viberg-ish heel taper, but I doubt Whites would oblige. 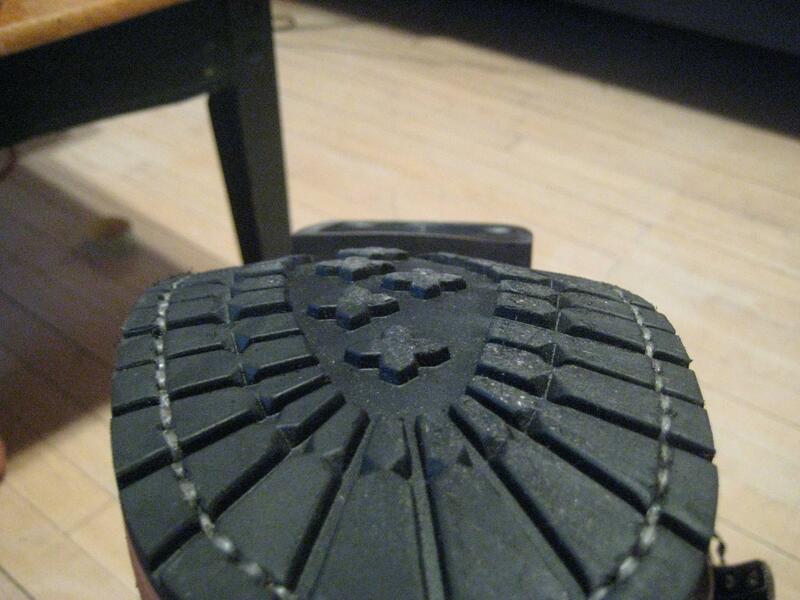 'have an inkling how long it takes to wear out a pair of Vibram composite soles? ... forever. 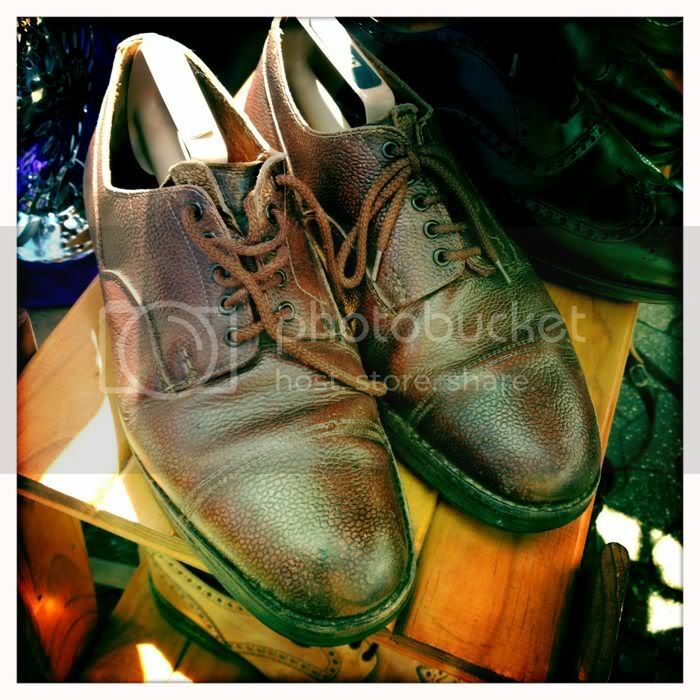 anyway, if i chose not to wait forever & decide to re-sole i'd take the commando half-sole route, like on Knuck's White's [as shown below] or the Alden "Ultimate Indy"
the thing is, if i want a full sole like the #700, i'd just get the SemiDress sold @Baker's or w/e & not wait 2-3mos. _it's about realizing an idea/concept. 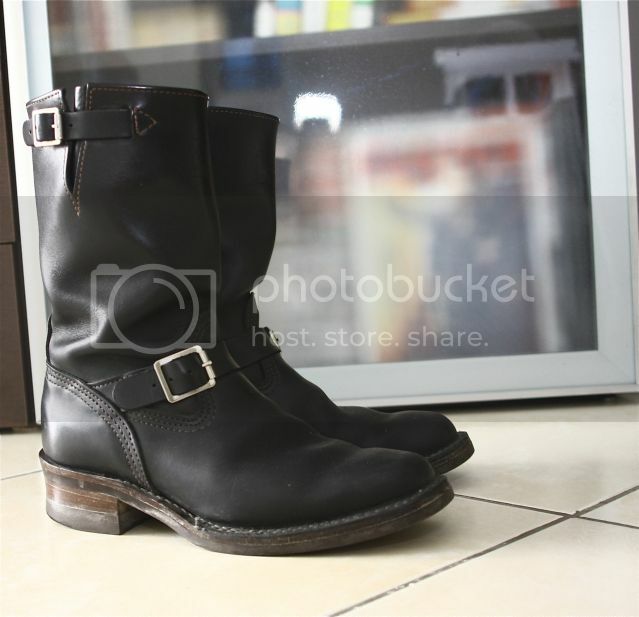 black chromexcel, natural sole, half commando, block heel (lowered 1/4), antique hardware. dislike the laces that came with them, any suggestions? heel height stays the same, no matter what sole configuration. They adjust accordingly. .. if you din't opt on the 1/4 lowering, ie. 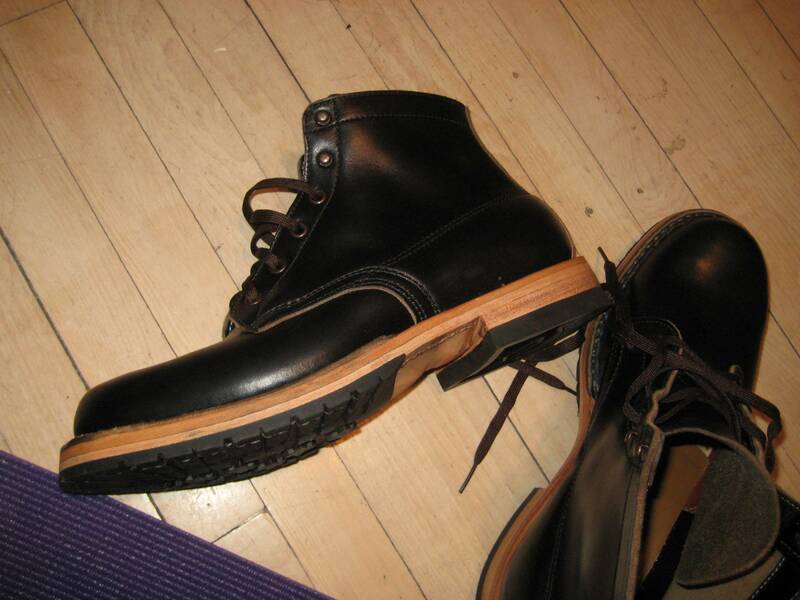 btw, any1 got the heel height measurement for a standard SemiDress on full sole [eg, #700 or 430]? how do those double soles break in? I imagine they start off extremely stiff and break in to just stiff? Ed, is the leather upper dark brown water buffalo? yes thats true until now theyre still quite hard . but i like the feel of it specially when done by okuyama san it give you a more"rolling" feel to it when you walk. Narrow engineers look great, last ones ar kinda ugly though. 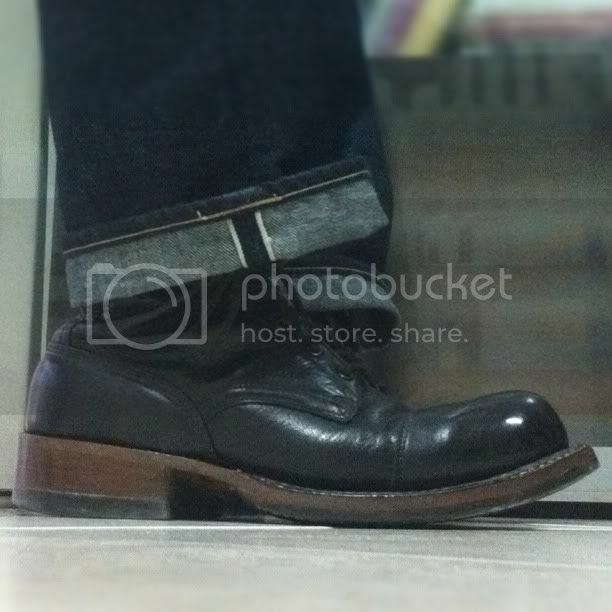 Hey what are the McNairy Boots like compared to the tricker's? 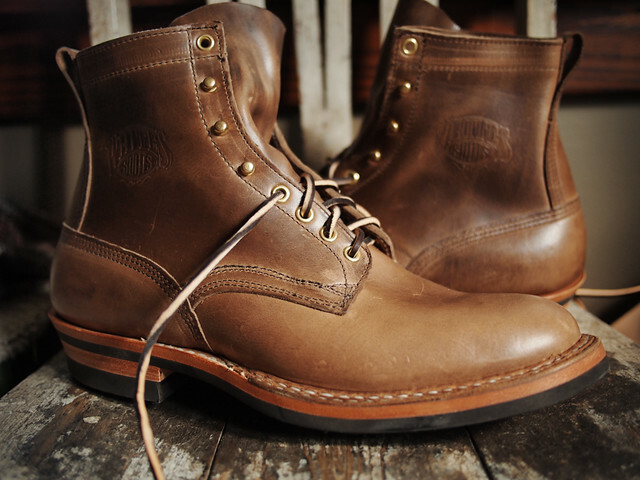 i fancied the McNairy Woolrich Woollen Mills boots, but bought tricker's instead. The McNairy's are Sanders right? 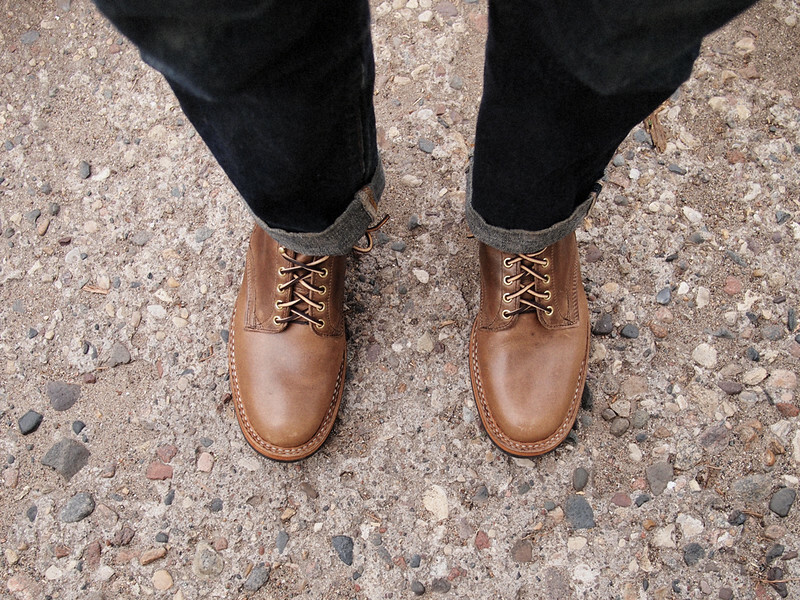 Anyone delt with the sand mohave leather red wing chukka? 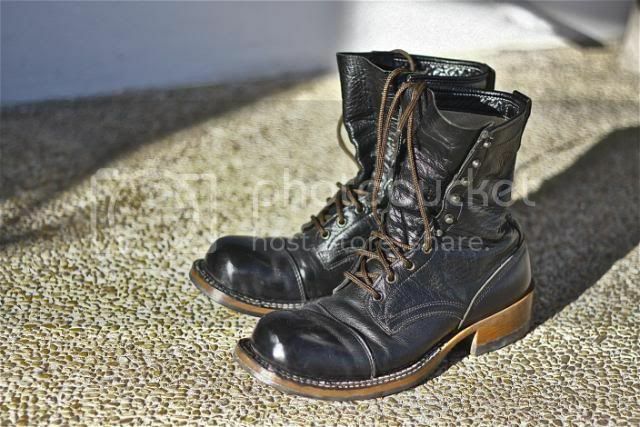 (In terms of aging, versatility, longevity, comfortableness) Thinking about going after it..
6" smoke jumper, SD last (so some people will call it a Bounty Hunter) Natural Chromexcel, 430 sole, natural sides, no celastic, 1/4" lowered cuban heel. Worth the wait at about 10 weeks total. Will do. I'm gonna get some better photos tomorrow, too. Light was already pretty bad when UPS arrived. i love em! the low pro looks super good! 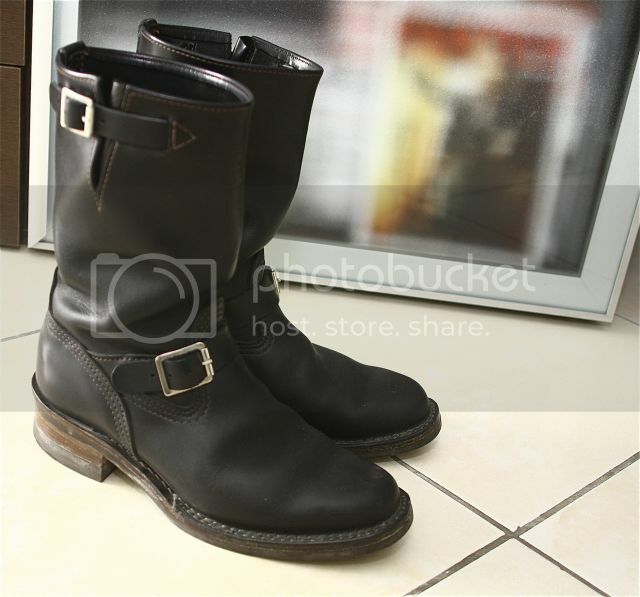 great purchase and that must have a leather man all tingly. Totally worth the wait. Those are amazing hollow. I'll be looking forward to more pics (on your feet and then evo). Those look good. The non celastic toebox actually gives it a Packer-ish look. Not a huge fan of chopping a 1/4" off the heel, but at least you went with a cuban! Wow, I didn't notice the stitching before, those are beautiful! Incidentally, I saw a pair of size 8 (more like 8 and a half) Lotus shoes in Greenwich last weekend. Â£35, I think. Exactly the same fit as my pair. Crash Test, awesome as always. Those are now practical as well as beautiful. 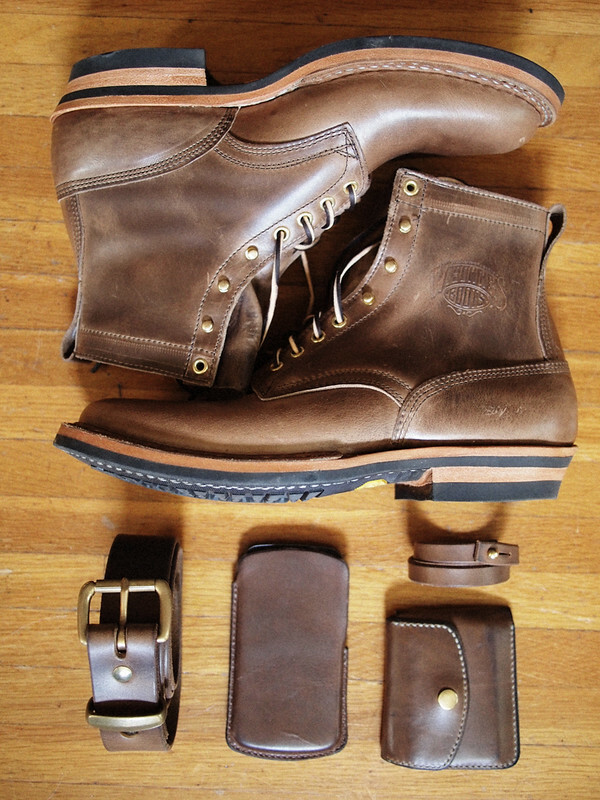 Should make a pretty strong winter boot.